تاریقلیزاده, هادی, حسینی امینی, حسن, جباری, اسماعیل. (1395). مکان‌یابی پناهگاه‌های اضطراری در سطح شهر، با رویکردپدافندغیرعامل (مطالعه موردی شهرستان کاشمر). فصلنامه جغرافیا ( برنامه ریزی منطقه ای), 25(2), 243-255. هادی تاریقلیزاده; حسن حسینی امینی; اسماعیل جباری. "مکان‌یابی پناهگاه‌های اضطراری در سطح شهر، با رویکردپدافندغیرعامل (مطالعه موردی شهرستان کاشمر)". فصلنامه جغرافیا ( برنامه ریزی منطقه ای), 25, 2, 1395, 243-255. تاریقلیزاده, هادی, حسینی امینی, حسن, جباری, اسماعیل. (1395). 'مکان‌یابی پناهگاه‌های اضطراری در سطح شهر، با رویکردپدافندغیرعامل (مطالعه موردی شهرستان کاشمر)', فصلنامه جغرافیا ( برنامه ریزی منطقه ای), 25(2), pp. 243-255. تاریقلیزاده, هادی, حسینی امینی, حسن, جباری, اسماعیل. مکان‌یابی پناهگاه‌های اضطراری در سطح شهر، با رویکردپدافندغیرعامل (مطالعه موردی شهرستان کاشمر). فصلنامه جغرافیا ( برنامه ریزی منطقه ای), 1395; 25(2): 243-255. امروزه شهرها علاوه بر مخاطرات طبیعی، در برابر تهدیدات نظامی و موشکی نیز قرار دارند. چاره‌ای جز، اعمال ملاحظات دفاعی و امنیتی در طرح‌های شهری نیست که می‌تواند نقش اساسی و تأثیرات قابل توجهی درکاهش آسیب‌پذیری شهرها دربرابر مخاطرات طبیعی و تهدیدات دشمنان داشته باشد. لذا این پژوهش با هدف، بهبکارگیری الگوریتم‌هایGIS، و شاخص‌های حیاتی چون شبکه راه‌های ارتباطی، کیفیت ساختمانها، قدمت ساختمان‌ها، مالکیت ساختمان‌ها، اسکلت ساختمان‌ها، تراکم جمعیتی، بناهای تاریخی، کاربری اراضی، چاه‌های آب آشامیدنی، و خطوط انتقال گاز، براساس مدل تحلیل سلسله مراتبی، در محیط GIS مکان‌یابی پناهگاه‌های چند منظوره شهر کاشمر را انجام داده است. نتایج پژوهش 14 مکان تحلیل حساسیت و اولویت‌بندی گردیده، با اعمال شعاع 900 متری به عنوان شعاع عملکردی، با استفاده از نرم افزار Expert choice است. Introduction: Today, cities are against on military and missile threats. Wars in comparing with past had different dimensions and complexity and greater violence. According to a theory, today's war has not included on the borders and cities have become the new battlefield. hence no choice but to, defense and security considerations apply the necessary measures in urban design using multi-functional and multi-functional spaces that can be have main role and significant effect on reducing vulnerability of cities in enemy threats against. The aim of this study was to investigate the factors that reduce vulnerability and secure living and working in the city, using a multi-functional shelter in urban planning and development based on passive defense considerations. 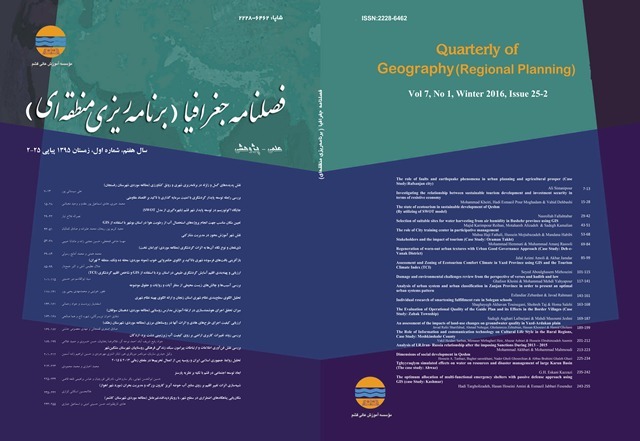 This study, using indicators such as land use, network communication, building quality, building age, building property, buildings structures, population density, historical building, drinking water wells and gas pipelines, based on hierarchical analysis model and also GIS has been applied in allocating of multi-functional shelters in Kashmar city. Methodology: According to research goals Kashmar city were selected for study and research in this field. City of Kashmar were located in the center of Khorasan province in northeastern Iran. The method of this study isoptimum locatin and allocation of multi-functional emergency shelters with passive defense approach using GIS.for this we established an analyzing vital factors, such as land use, network communication, building quality, building age, building property, buildings structures, population density, historical building, drinking water wells and gas pipelines, based on hierarchical analysis model and also GIS has been applied in allocating of multi-functional shelters in kashmar city. In order to provide the best location for multi-functional shelters in the city, or perform an optimal allocation or location, with each level of importance for each facility or site,should be done in the regular process with consideration to vital indices. For example the best process in location has rour steps: 1) exploring the characteristics of site or activity 2) study of the proposed area condition 3) determine the main factors and their weights 4) collecting information and required data for indices. And in this study for locating themulti-functional shelters we estabilished on mentioned process and followed all the ruls and steps. Result and Discussion: One of the most important needs in times of crisis, is using of the buildings that have the potential to become sanctuaries, to deploy the people in it and to provide their needs. Buildings such as warehouses, parking lots, buildings with no military value, libraries, chain stores and subway stations, mosques, etc can be mentioned. These places aren’t in strategic shapes but they can take a strategic role. We can change their usges, during the crisis, and used the potential spaces as a shelter. Vulnerability of urban areas are different from one place to another. Therefore, in this study, we classified the areas of kashmar city to find optimal areas for establishing of civil defense shelters in compliance with the essential predictors and factors. Therefore according to these optimal areas, shelters allocated to the appropriate areas with AHP method, and 14 spots with an area of 200 to 500 square meters were selected. Finally the sensitivity of these 14 spots, were analyzed, by Expert Choice software in consideration with 10 vital indicators, used in the location process. Conclusion: The results ofoptimum location and allocation of multi-functional emergency shelters with passive defense approach using GIS, indicated that about 14 zones has been sensitivity analysis and prioritizing, and by applying a 900 meters radius as functional radius using software Expert choice all of allocation shelters has been located in within the city limits cover and those in the radius of destruction assets are critical for crisiss management. Generally all the people in the city, can be deployed in located shelters. اسماعیلی شاهرخت، مسلم (1389). آمایش شهری با رویکرد پدافند غیر عامل (نمونه موردی: شهر بیرجند)، پایان نامه کارشناسی ارشد به راهنمایی دکتر علی اکبر تقوایی، دانشگاه تربیت مدرس. اصغریان جدی، احمد (1386)، الزامات معمارانه در دفاع غیرعامل، دانشگاه شهید بهشتی، تهران. پژوهشکده معماری و شهرسازی، 1389، طرح الگو و دستورالعمل مکان‌یابی مراکز حیاتی، حساس و مهم از منظر پدافند غیرعامل، دانشگاه صنعتی مالک اشتر-مجتمع دانشگاهی آمایش و پدافند غیرعامل. حافظ نیا محمدرضا (1387). " مقدمه‌ای بر روش تحقیق در علوم انسانی " انتشارات سمت. حسینی، سید بهشید (1389)، تدوین معیارهای اصلی پدافند غیرعامل در طراحی معماری ساختمانهای عمومی، دانشگاه هنر، تهران. رضایی، سعید (1388). مکان‌یابی با استفاده از سیستم اطلاعات جغرافیایی، مطالعه موردی: اسکله بندرعباس، مجله پدافند غیرعامل، شماره 1. صراف جوشقانی، حسن و محمد صراف جوشقانی (1389). مدل سازی اقدامات احتیاطی در تدوین نقشه راه پدافند غیرعامل مجموعه شهری. متقی، افشین. حسینی امینی، حسن (1395). ژئوپلیتیک شهری با تاکید بر پدافند غیر عامل، نشر انتخاب.